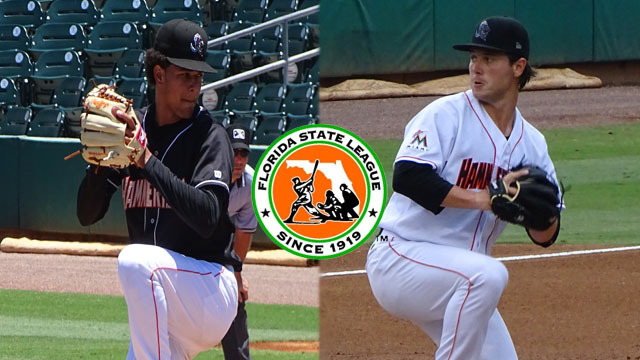 Jupiter, FL - Luis Castillo has been selected as the Pitcher of the Year in the Florida State League. Castillo went 8-4 with a 2.07 ERA in his 23 games with the Hammerheads during the course of the 2016 season. This is the third such honor for the Castillo who has also been named to the mid-season All-Star team and Postseason All-Star Team. Luis Castillo reached a season high eight strikeouts on July 3rd at Fort Myers and continually confused opponents with his velocity and movement, touching 101 miles per hour on his fastball and working into the low 80's on his off-speed including a nasty slider. Castillo was the top statistically ranked pitcher in the Florida State League at the time of his departure for Double-A Jacksonville in late August. Castillo is just 23 years old and was acquired via-trade with the San Francisco Giants in 2014 by the Miami Marlins. Castillo has already blown away any doubts and has had one of the more impressive seasons at the Class-A Advanced level. Joining Castillo on the Postseason All-Star Team is left handed pitcher Dillon Peters, both have recently joined the Jacksonville Suns. Peters went 11-6 with the Hammerheads this season, with a 2.46 ERA which was good for top 5 in the league and win total that was tops in the league at the time of his departure for Double-A. Peters recorded a season high seven strikeouts against the Northern Division first half Champion Tampa Yankees on July 11th. Peters has one of the best back foot sliders in the minor leagues and was a huge part of the Hammerheads push for the playoffs post all-star break. At one point during the 2016 Florida State League campaign, Peters won five straight starts posting at least six innings in each appearance from the mound. The Hammerheads boasted five mid-season All-Star team members, Esmerling De La Rosa, Luis Castillo, Dexter Kjerstad, Taylor Ard and John Norwood and in a year where Jupiter has risen from the bottom to the top of the Southern Division, it is a credit to the coaching staff and player development that has gone on at the Class-A Advanced level to have so many talented players continue to improve and move closer to their potential. Dillon Peters delivered with a WHIP currently below one and seven consecutive wins between Jupiter and Jacksonville to become one of the rising prospects in the Marlins system this season. The Hammerheads finish the regular season on the road at St. Lucie beginning tonight and ending on Sunday in a battle for first place in the South. Keep track of your Hammerheads and be sure to buy your playoff tickets when Jupiter punches theirs! For more information about current and past Hammerhead players, visit jupiterhammerheads.com. To purchase tickets call (561) 630 -1828.